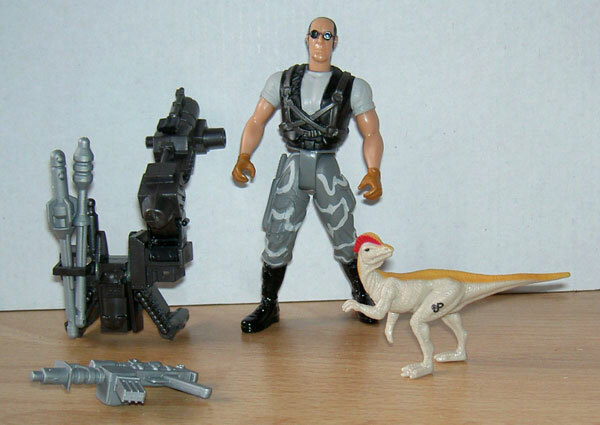 Action feature: "Big Game Hunter" with Heavy Strike Weapons Pack & Parasaurolophus Hatchling. Description: Ajay stands in a largely neutral pose, except for his right leg which is moved slightly forwards. He sports an almost military outfit, namely a light grey shirt with a black vest and dark grey straps over it, brown gloves, grey pants with light grey stripes in an asymmetrical pattern suggesting camouflage on them, and black boots. He also has a pair of black sunglasses on. He has absolutely no facial expression, a bald forehead, and black hair on the back of his head. He’s got some detailing on his pants, though it’s hardly noticeable because it’s coloured in the same grey as the pants themselves: on his left leg he’s got one pocket, while on his right leg he has a knife as well as some damage to his pants, indicating he’s had a near miss with some ferocious vermin. Ajay comes with some impressive looking weaponry. First, he owns a small gun (I’m no expert on guns so don’t ask me what type of gun it is), coloured grey. It doesn’t do anything, it’s just an additional gadget. Second, he sports a large backpack, labelled a Heavy Strike Weapons Pack (I’ll abbreviate it to HSWP). It’s basically a pack carrying a missile launcher, enabling the user to keep his hands free to carry other stuff. The HSWP, sporting an entirely black paint job, looks pretty sophisticated and detailed, but works fairly simple. It can be pinned to Ajay’s back (he’s got a hole there for this purpose). The rocket launcher can move up and down, in about a 100 degree angle: it can also be detached to be used separately from the pack. The launcher comes with two different grey missiles (same colour as the gun), and can hold one of them at a time. The other can be stored in a hole in the pack when it’s not used: the hole also fits both missiles simultaneously. By pressing the button on top of the pack a missile is launched with a decent enough force, over a distance of about half a metre. Interesting little detail, the gun can be pinned on a pin on the right end of the launcher. 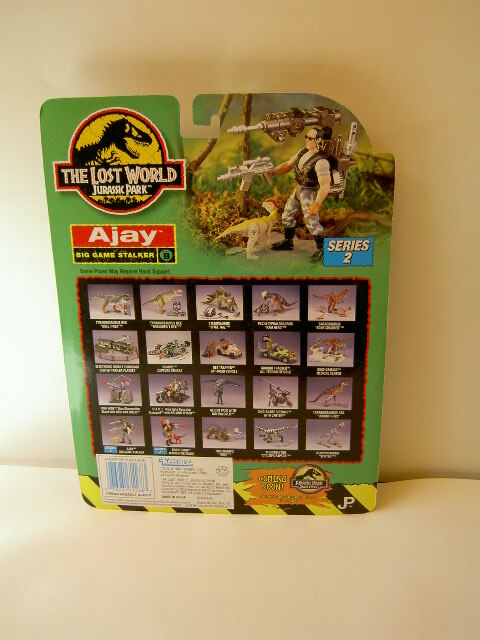 Ajay’s reptilian companion is a Parasaurolophus hatchling, according to the package. However, it misses Parasaurolophus’ most recognizable attribute: the horn on his head. Instead, this creature sports a crest. This hatchling stands in an active pose, looking over its shoulder and its left arm raised, while in a walking posture. It is painted beige for the most part, and sports a large yellow stripe all the way from the snout to the end of the tail, also running over the top of the crest. The sides of the crest are coloured bright red. The dinosaur has small black eyes, as well as a black JP: Site B logo on its left upper leg. Analysis: though this is quite a fun figure, it’s a bit over the top. Ajay himself looks almost nothing like the Ajay seen in the movie, except for the head sculpt. He’s way more muscular and looks more like a special forces commando than a game scout. However, if you leave realism aside this is a pretty butch figure with a good paint job, though it’s a shame the knife and damage to his pants aren’t painted in a different colour. He would have looked more badass with skin or blood underneath the torn parts of his trousers. His accessories establish him to be a character not to be messed with. His gun, though pretty monochromatic and lacking some detail, makes him look dangerous. The same goes for the HSWP, though this too looks a bit unrealistic, but it works fine. It can be pinned to Ajay’s back easily and fights tightly so it doesn’t fall off (unlike with Nick van Owen’s Catcher Pack for example). The launcher can be posed in various angles and can even be detached from the pack, increasing flexibility and playability of the pack. The missile firing mechanism works perfectly, though the impact force isn’t too great. It’s sure to knock over hatchlings like the Para, but has a harder time doing damage to bigger targets. The storage hole on the back of the pack is a handy detail, though when there’s only one missile in there, it hangs a bit loose. It’s a nice little detail to see the gun can be attached to the pack as well, though it doesn’t really seem to have a purpose. The hatchling is the only real disappointment of this set. It sports a boring paint job and stands in an awkward pose. Also, it doesn’t look like a Parasaurolophus at all, but rather a different species of Hadrosaur. It also has trouble standing on its feet. Playability: good for the most part. 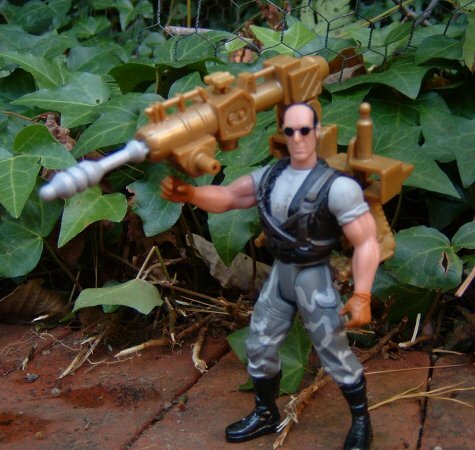 Ajay has no action features himself, like his fellow Evil Hunters Peter Ludlow and Dieter Stark, but has the usual range of poseable body parts. The HSWP provides for the action of this set. The storage for the missiles and the capability of detachment of the launcher make for greater playability. The launcher itself works fine as well. Like other hatchlings, the Parasaurolophus has no poseable body parts, while its annoying stance further diminishes playability options. Realism: not much. Ajay (his last name being Sidhu by the way, though the card doesn’t mention this) looks very different from the Ajay character in the movie (played by Harvey Jason), both in body shape and choice of clothing. The head sculpt resembles the movie character somewhat, though in the film he wore regular glasses, not sunglasses. Additionally, he didn’t sport a gun like this, nor a HSWP or any other missile launchers (which weren’t featured in the TLW movie anyway). Like stated above, the Parasaurolophus doesn’t resemble a real Para or its movie counterpart much. 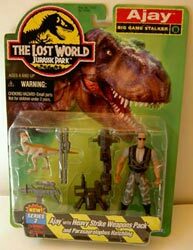 Though the body isn’t far off, and even the paint job is somewhat reminiscent of the paint job of the Para seen in the movie and the TLWS1 Parasaurolophus figure (though simplified and less detailed), it’s the head that’s totally wrong. This figure sports a crest instead of Para’s iconic “horn” (probably used for communication and mating rituals). This hatchling looks more like a Corythosaurus, a related Hadrosaur that did indeed have a crest, though shaped somewhat differently. Incidentally, Corythosaurs were seen in JP III, in a herd that also included Parasaurolophus. But that particular detail doesn’t make this figure more accurate. Repaint: no. The hatchling would not be repainted either. 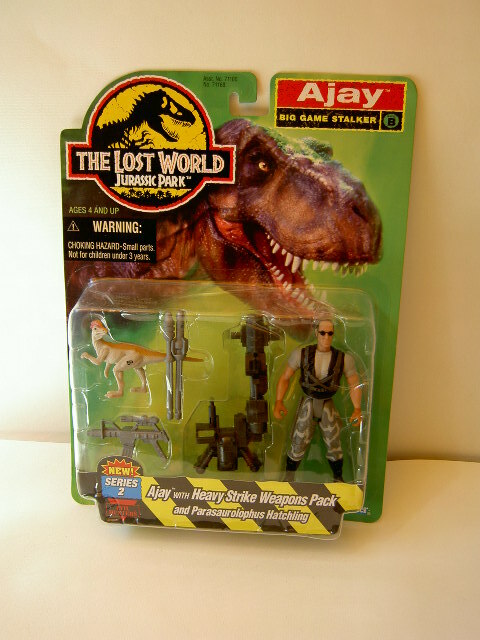 However, Ajay’s body would be repainted two times for the first JP Dinosaurs line, once as a Dinosaur Trainer (for the Pachycephalosaurus with Dinosaur Trainer set, including a repaint of the HSWP and the gun) as well as a Dinosaur Hunter (for the Stegosaurus with Dinosaur Hunter set). In both cases, the figure would sport a different head sculpt. Ajay’s own head would not be featured in later toy lines, repainted or otherwise. Overall rating: 8/10. Ajay himself is a badass figure, never mind realism. The HSWP is a fun new weapon and works fine, and the gun is a neat little extra gadget. The hatchling is a bit of a failure though. Unfortunately, this figure is rather rare and not easy to find. Be prepared to deal with higher than usual prices when you encounter it. However, it’s worth it, if you can stand lousy hatchlings and are also interested in human figures.